Upon your arrival, your tour guide will meet you at Guilin airport or train station, and transfer to your hotel in downtown Guilin. Then, drive to visit Guilin’s city highlights: Reed Flute Cave - a huge limestone karst cave with the exquisite stalagmites and stalactites in a variety of shapes; Yao Mountain is the highest mountain in Guilin city, the open cable cars will take you up to the hilltop for a good view of the karst peaks and surrounds; and West Hill - one of the most famous hills in Guilin; but it is always non-touristy and not like the other crowded scenic spots in the town. After the visit, return to your hotel. In the evening, enjoy your free time around Guilin’s Central Lakes (Shan Lake and Rong Lake) area and the nearby pedestrian street. 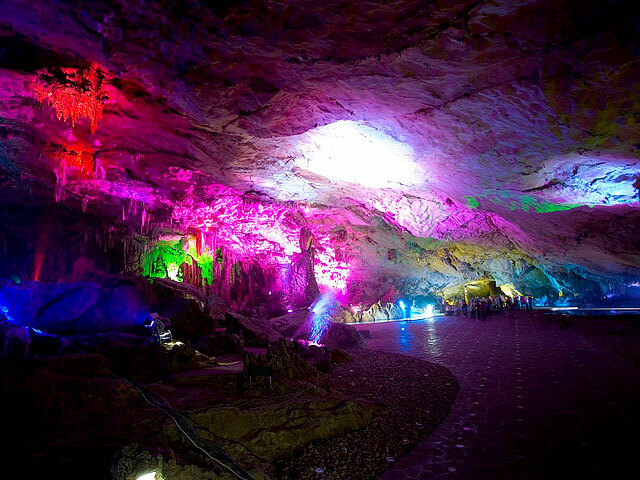 Within Reed Flute Cave, make a exploration into this large karst cave. 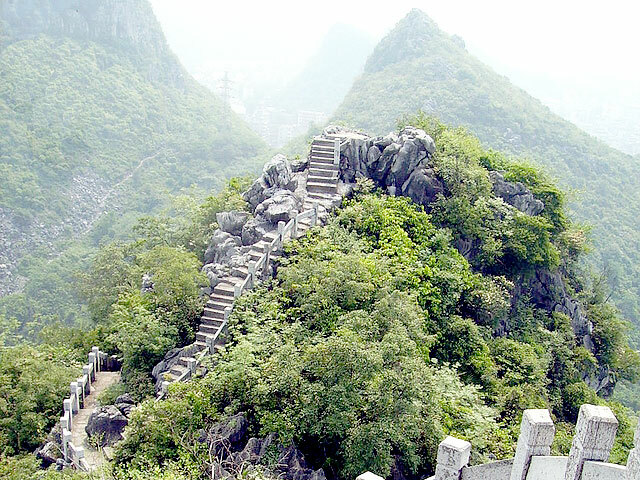 Within West Hill park, hike on the mountaintop and get a bird view of Guilin. Check out your hotel and meet your guide at the hotel lobby in the morning. Then drive about 1 hour to reach Yangdi and start your Li River hike there. The hiking trail from Yangdi to Xingping is about 18 kilometers/12 miles; and the terrain doesn't have any ups or downs. It is needed to walk 4-5 hours through six villages and cross the river by ferry boat three times. You will enjoy the beautiful mountains, verdant fields, farms and villages with water buffalos, cows wondering along the whole way.After your arrival at the ancient town of Xingping, have a relaxing stroll along the well-preserved street. There followed, drive to Yangshuo – a small town with attractive countryside scenery; then check in your Yangshuo hotel and enjoy your free time. In the evening, watch the fantastic light show of Impression Sanjie Liu – directed by the famous movie director Zhang Yimou who is the same director for the opening ceremony of Beijing 2008 Olympics Games. 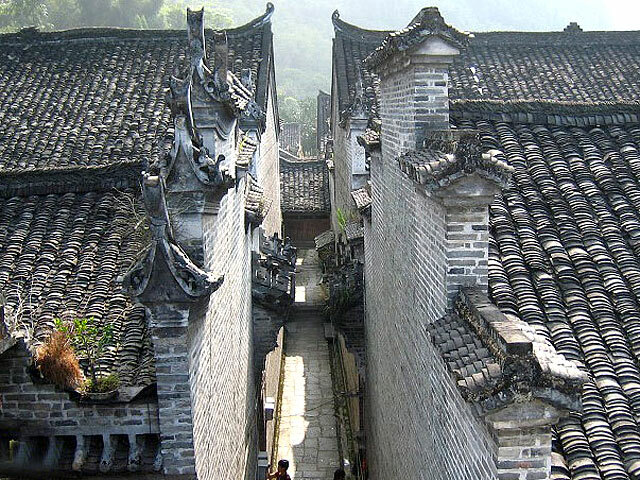 Xingping Ancient Town with well-preserved old folk houses. After breakfast, transfer to Guilin airport or train Station for your departure flight or train to your next destination. Service ends. 1. The tour arrangement on the 1st and 3rd day would be adjusted to meet your Guilin arrival and departure time. 2. Comfortable walking shoes are needed for the Li River hiking. 1). All transfers and city transportation. 3). Hotel accommodations listed on the above itinerary. 4). Meals are included as specified (B=breakfast, L=lunch, D=Dinner). 5). Entrance Fees to the scenic spots as listed in the Itinerary. 1). Tips to your tour guide and driver. Could you please provide me with prices/an itinerary for the 3 day Li River tour? I am expecting to be in Guilin in June 2019. Thank you for contacting and requesting our Guilin Hiking tour along Li River. We're local tour operator with over 18 years' experience in inbound tours. We're special in Classic Tours, Walking Tours, Educational Tours, Cycling Tours, etc. And Guilin is a great place to combine outdoor activities with sightseeings of natural landscapes and minority cultures. We offer free service to customize you trip according to your specific requirements, all free before you agree with our proposal and decide to make reservations. Our travel consultant will contact you via email soon and offer more details. We are so pleased to be of service to you. Regarding your trip to Guilin, our travel specialist willl be in touch with you soon via email.